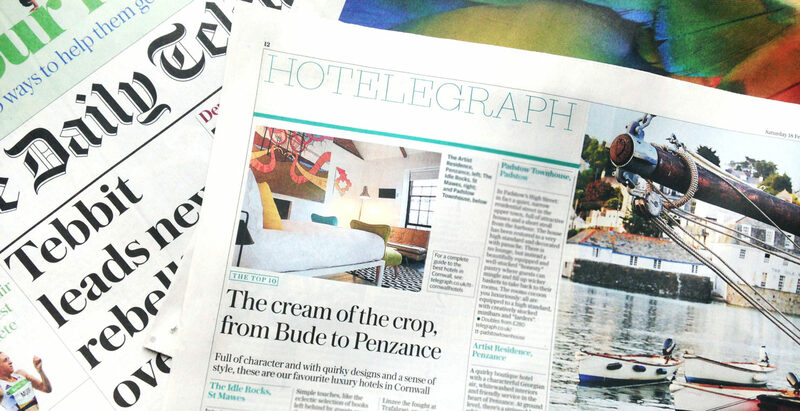 Boutique hotel The Old Quay House was featured in The Telegraph’s top 10 luxury Cornwall hotels in February, achieving a Telegraph expert rating of 8/10 from journalist Lesley Gillilan. The hotel also appeared in Good Things Magazine for The Great Cornish Food Fight, an event which took place over two evenings in early Spring in collaboration with The Old Quay House’s sister hotel, The Rosevine. The occasion also earned coverage in a multitude of regional papers including the Cornish Guardian, West Briton and The Cornishman, and head chef Richard Massey was interviewed by Debbie McCrory for BBC Radio Cornwall. The Old Quay House has been cited on multiple occasions as a romantic destination, including in The Evening Standard’s roundup of the best romantic holidays to take in 2017: from Cornwall to Chile; Red Magazine’s the most romantic hotels in Cornwall; and Food Magazine’s top romantic retreats. 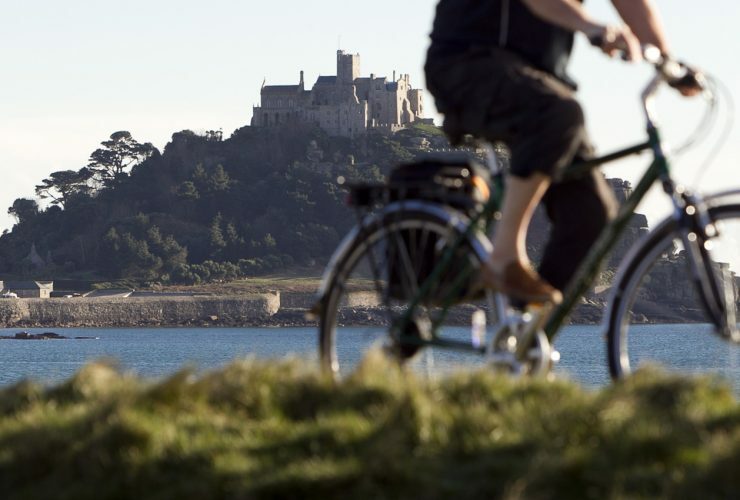 The Times also has the award-winning hotel and restaurant on its radar as the go-to bolthole in the south west, featuring The Old Quay House in Britain’s best spring escapes, while Times Travel Doctor Julia Brookes recommended the hotel for a quiet stay on the south west coast with access to great restaurants. Nancarrow is a working farm and idyllic event venue, regularly hosting feasts using the farm’s certified organic produce. Nancarrow joined our client books in early spring and has since enjoyed a multitude of press coverage celebrating the farm’s offerings, including in The Independent, Olive Magazine, Good Things Magazine, BBC Good Food and The Daily Telegraph. Nancarrow was also featured on BBC1’s Countryfile for its 1,000 Mouths event, which aired on Sunday 22 October with an impressive 6.95 million people tuning in to watch. Family-owned hotel, bar and restaurant The Beach at Bude was included in The Daily Telegraph’s cream of the crop in February, and The Times’ 20 great British beach hotels, whilst Country and Town House touted the hotel as ‘the hottest of Cornish hotspots’, with a glowing review of the beach-side retreat after a stay in early May. The Beach was also featured in USA Today’s top 20 scenic seaside hotels in Great Britain; Red magazine’s 20 best boutique beach hotels in Europe; and The Mail Online’s round-up of the most stunning restaurant views in the country. The hotel has played a significant role in placing Bude on the foodie map, with head chef Joe Simmonds impressing Coast Magazine editor Alex Fisher, editor of Cornwall Live Lee Trewhela, and Luxury Lifestyle Magazine contributor Bradley Edwards, among many others. The icing on the cake was the hotel’s inclusion in The Sunday Times top 100 hotels list in the autumn. The tenth edition of Aspall Polo on the Beach took place in mid-May and earned a wealth of coverage before, during and after the event, featuring on the pages of The Telegraph, The Times, The I, Coast Magazine, Good Things Magazine, and Country and Townhouse. The three day event was also celebrated as one of the best free things to do with the kids by The Huffington Post. The event also sparked interest with multiple television and radio programmes including BBC Spotlight, ITV Westcountry News, BBC Radio Two, BBC Radio Cornwall and Classic FM. Our campaign for the event was shortlisted for two CIPR Pride Awards. Award-winning architecture practice Laurence Associates were new to our client books in 2017 and have achieved lots of coverage in multiple consumer and trade magazines since we began working with them in April. Highlights include features in Architects Data File, Business Cornwall, Homify and I Build Magazine, which ran an interview with company co-director Jason Pledger for a self-build advice article, and a five page spread on an extension project. The company has also been cropping up in Grand Designs magazine on multiple occasions, with an article on self-build advice, and a feature on how to find the right architect. The Cornish Bed Company is one of the last remaining foundries in the country to hand cast iron, brass and nickel beds using traditional Victorian methods, and the company earned multiple inclusions in the top interior and design publications in 2017, including ELLE Decoration, Period Living, Good Homes, Country Homes & Interiors, and Ideal Home. Cornish farmstay The Olde House has cropped up numerous times in the press over the last year, both for it’s wonderful holidays and for its impressive sustainability efforts, which have been picked up in a wealth of trade media. The Olde House was featured in The Times’ best family holidays for Easter, and a two page spread in The Sunday Telegraph for a feature on lambing, which was syndicated on Yahoo! News. 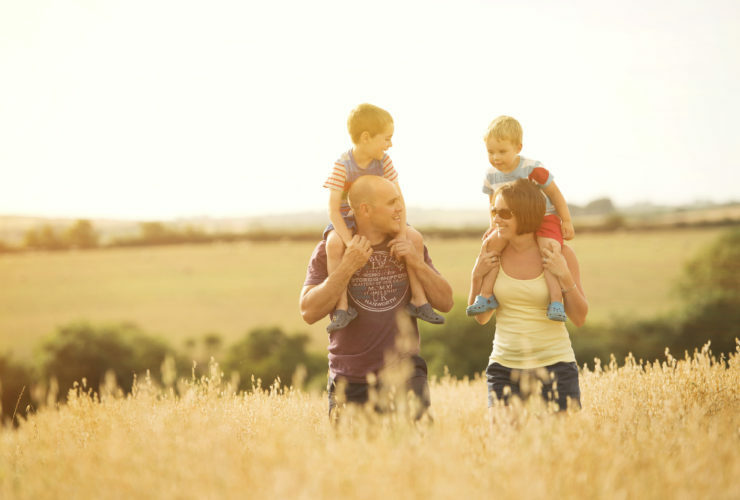 Journalist Ali Wood also enjoyed a stay at the farm with her family, producing a brilliant write-up in the March issue of BBC Countryfile magazine. 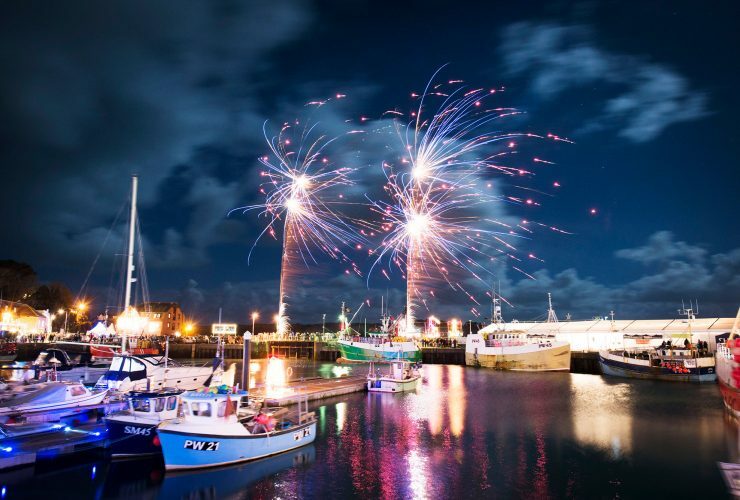 The annual Padstow Christmas Festival was a huge success in 2017, taking place over four days in December and drawing tens of thousands of people to the harbour town. The event was featured in Waitrose Food Magazine, I News, Delicious Magazine, Food & Travel Magazine and more. Account Director Sarah Norman also drafted a four-page article on the legacy of Rick Stein, which was featured in Cornwall Today. We also coordinated live interviews with chefs, stallholders and event sponsors prior to and during the festival with Debbie McCrory on BBC Radio Cornwall, and an interview with Rick Stein aired on BBC Spotlight, whilst the event was also mentioned on Chris Evans’ BBC Radio 2 breakfast show. Overall, coverage for the event achieved a reach of more than 20 million people. London-based pub group Three Cheers Pub Co. is made up of eight venues in south London, offering a unique experience at each location, with live theatre above The Latchmere in Battersea; and beautiful accommodation above The Tommyfield in Kennington. Many of the pubs boast lovely gardens and terrace areas too, including The Princess Victoria in Shepherd’s Bush, which was acquired by Three Cheers Pub Co. in October of 2017. The pubs have been featured in a wealth of outlets, particularly online, with inclusions in round-ups of the best pub beer gardens in London in the Evening Standard, Yahoo! News, Squaremeal, Gentleman’s Journal and the Huffington Post UK; and the rebirth of pub theatre on The Guardian, featuring a mention of The Latchmere and its resident theatre, Theatre503. If you would like to find out how we can achieve similar coverage for your business, please get in touch.